Literacy and socio-economic indicators of Balochistan province in Pakistan are a grave reminder of the state of poverty in the region. Asmat Kakar draws from his personal experience of growing up in the region and writes that only education can level the playing field and provide socio-economic development. Social scientists and international organisations are of the view that access to high quality primary education can make a substantial and enduring difference to the lives of children living in poverty. Education is a great equaliser, increases access to high education and productivity, resulting in higher economic gains and social mobility. Education can help break the cycle of poverty and bring about socio-economic upward mobility. Pakistan, in general, Balochistan, in particular, faces an education crisis of exceptional proportions due to poor socio-economic conditions and negligence on the part of the government towards provision of high quality primary education. Alif Ailaan’s 2017 report on Pakistan District Education Rankings shows worst condition of education system in Balochistan province. In terms of overall education, Balochistan with 54 score stands at number six out of all eight regions of Pakistan. With regard to primary school infrastructure and learning outcomes Balochistan stands at number seven and six respectively. With regards to retention of students and gender parity, the Balochistan stands at number six. Moreover, Balochistan has the worst profile with reference to readiness beyond primary school. According to the Ministry of Education report Pakistan Education Statistics 2015-16, Balochistan is on top of the list, with an alarming 70 per cent children out of school. About 78 per cent of girls and 63 per cent boys are out of school in the province. According to Pakistan Economic Survey 2016-17 , the literacy rate in Balochistan has fallen to 41 per cent in 2016 as compared to 44 per cent in 2015 and the province has the lowest literacy rate in the country. Moreover, the province has 24 per cent female and 56 per cent male literacy rate. The figure is 15 per cent for females and 48 per cent for males in rural areas while in urban, it is 44 per cent and 76 percent for females and males respectively. UNDP,  Oxford Poverty and Human Development Initiative, and Federal Ministry of Planning and Development published a report on Multidimensional Poverty in Pakistan in 2016. It states that more than 70 per cent and around 85 per cent people in rural areas of Balochistan province are living in multidimensional poverty. The main contributor of poverty in Balochistan province is deprivation in education and it accounts for about 43 per cent for endemic poverty in the province. This high percentage shows that lack of quality primary education is the main cause of socio-economic underdevelopment in Balochistan, which needs robust and sustainable measures from provincial government to level the playing field of socio-economic development for the poor children of the province. As the nature of workforce shifts from manpower to brainpower, quality primary education can bring the highest returns from individuals, societies and countries. Therefore, developing strong cognitive and non-cognitive skills are now the need of the hour. As Nobel Laureate Professor James Heckman says, “cognitive abilities are important determinants of socioeconomic success”. The World Bank study The Development of Education in Singapore Since 1965 on Singapore’s development validates this argument that access to quality primary education can level the playing field of socioeconomic development for poor children. I am a beneficiary of quality primary education. I grew up in Balochistan in Killa Saifullah, Balochistan and I had access to quality primary education. With that foundation, I was able to get a Master’s degree from the London School of Economics and Political Science with financial support from the school and Commonwealth Scholarship Commission in the UK. This has further enabled me to earn enough to support my family and also develop a vision and passion of working for the people who live through poverty. Many people of my district have still been unable to come to terms with or understand the fact that the son of a driver has reached this status. This is because people are still unable to appreciate that realising the potential their children through education can help them out of poverty. When people internalise the fact that children can’t reach or compete with children of well-off backgrounds then it becomes difficult to harness their potential for their socioeconomic development. 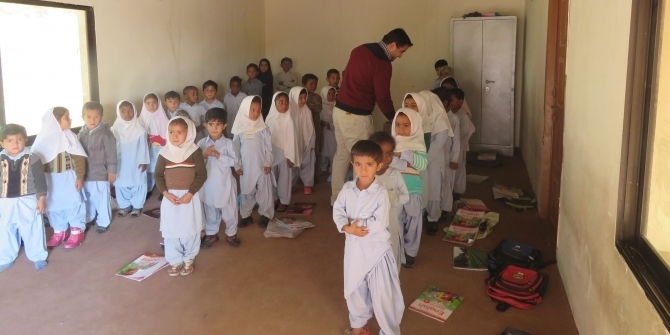 Though many international organisations such as European Union and World Bank are supporting Government of Balochistan (GoB) in improving primary education in the province but it doesn’t mean that GoB should not fulfill its constitutional obligation of provision of quality education for its 1.8 million out of school poor children. The insertion of Article 25A through reforms introduced through 18th Amendment to the Constitution of 1973 made free access to quality primary education compulsory. But, the government needs to concentrate on this on priority basis. Moreover, people have to hold government accountable for failure to ensure implementation of this constitutional obligation. To deal with this problem, it is important to mobilise people at the grassroots level and in a cost-effective way by organising them at the community, village and union council level. It is very essential to equip those living in poverty with quality education and, as Amartya Sen says, enable an individual to “achieve those things that one has reason to value”. Asmat Kakar, Monitoring and Evaluation Officer for European Union Funded Balochistan Rural Development and Community Empowerment Programme. He completed his MSc in Social Policy and Development at the London School of Economics and Political Science in 2016. He tweets @asmatkhan19. Congrats Asmat for coming up with such an informative, informative and inspiring piece of writing. Please keep contributing.